Just wondering how Lily is doing? Thank you for asking about Lilly. Lilly is my sweetie pie. She has change so much as we are approaching out third Christmas together. She loves cuddles & hugs. She wags her tail more and more. I ask her "Lilly are you OK?" and she answers me with a waggie tail. We went on our first big outing to Glacier Park this past summer. She relaxes more in the truck but she sits on my lap most of the time or sticks her head out the window as I hold her. She got the hang of getting out of the truck to play around and then getting back in. That used to be one of her fears, the fear of traveling to "heck knows where" and not knowing her destination. Her favorite place is still "home." She is very vocal with all the Chow talk. She even barks more now, which is OK. If she hears our neighbor's dogs bark from a mile away she gets this "shut the heck up" attitude in her bark. She will bark at a passing car on our dirt road, giving them a warning to stay away. Lilly loves the storms, she has no fear. Last year I took her out for her last spend a penny moments. The night was dark and there was gale force winds. She started to run into the forest & I yelled for her, she came back & started running to the back of the cabin. I knew it was icy on the landing at the bottom of our porch but I stepped out while I was calling her and I fell face first into the snow. Lilly came back and started smelling my face. It is so cold up here in Northwest Montana & Lilly loves it! It's been 0 degrees for almost a week. We go out frequently during the day for shorter periods of time. She is so good, she knows when I tell her "it's too cold for mommy" she heads to the cabin to go inside. As a matter of fact, Lilly & I will be going out for our last spend a penny moments in a few minutes. It's almost 8pm, so very cold & so very dark. 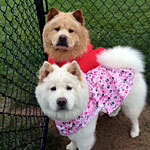 I have been hanging out lately on the I love Chow Chow Facebook site. I was recently thinking of posting more of our story. Lilly, Mike & I are a family. We have met our challenges full face forward. I'm so glad to hear how well Lilly is doing. I always love to hear your stories (as well as the previous Me & Tess stories). Lilly sounds like she has adjusted very well and gotten over most of her fears from when you first got her. Our weather has been quite cold this past week and Cocoa has been loving it. It is a nice change to see her happy and playful after a particularly long fall allergy (hot spots & itches) season this year. I am so glad to hear that you and Lily are doing well. How is she doing with Mike these days? I know there were some issues there and I have felt bad for him. Lilly is doing better with Mike, but she still has her moments. She accepts treats from him and he has taught her to smell them first before she takes them. She also likes to go on longer walks when Mike is with us. On our walks she likes to take the lead now. Before she was more submissive, or she would run back home. She is more sure of herself now, better self esteem. We had a bear scare earlier this spring. Lilly and I were walking to the creek and we heard a bear's growl on the other side. We made a quick exit of the trail back to the cabin, not running, just walking quickly. Then that night I took her out around 9pm it was dark & Lilly got spooked. I pointed my flash light in the direction of where there could have been a bear & didn't see anything. What ever it was it really scared Lilly. I went to take my shower and she followed me in, huddled between the tub and toilet. After I got dressed for bed, I sat on the sofa and Lilly jumped up and put her head under my arm and on my chest, she couldn't get close enough to me. Mike sat on the sofa with us & she snuggled into Mike's chest. We had close encounters with bear before, she never acted that way until that night. When we take her in the truck, Mike has to pick her up to take her out and put her back in. She has been good with him. There are still some things she doesn't like, repeated words & repeated gestures. I have to say sometimes Mike teases her and she won't put up with it! I joined the forum in July so I wasn't familiar with your story. After reading this post I went back and read your story about Lily. You've had quite an adventure. I enjoy your writing style and I am going to go back now and read your story of Tess. Thank you for sharing your stories. We have much in common. My wife and I have had Chows for 28 years. We're in the Cody, Wyoming area so your tales of the forest and the snow really hit home with me. I'm glad you never gave up on Lily. 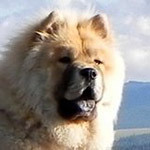 She's a beautiful Chow and she has a great mom with you. She may have had a rough start but it seems that your love has brought her far away from those dark times in her past. She's a very lucky Chow Girl to have you and Mike. Please keep the updates coming and I hope you and Lily have even more success in the future. I really should start posting on Lilly's site. 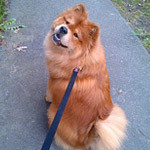 I think writing about her in the context of the here and now & I do have memories to share of my little Chow girl. One of the things that I missed that I did with Tess, was take her, pulling her to me. I wanted that so much from Lilly. Now she lets me do that, I take her in my arms & pull her towards me and she melts. I always have given Lilly hugs, but she stiffened up if I tried to pull her in to me. She plays with me more & now that there is snow on the ground she is a very happy little girl. We are going further into the woods now to do our hikes. We still watch for bear. If we see deer in the area I feel a little relieved and we hike on. One of Lilly's endearing gestures, she goes in between my legs and looks up at me. I pet her under her chin, this makes her happier & we do a gentle play. I do love her so very much. It is a little after 8 pm, this will be our last walk for the night. We just stay in our clearing. Lilly likes to sentry around the cabin a few times and then we walk around the garage. Sometimes she likes to go a little ways into the woods which makes me somewhat nervous, & I don't take my eyes off of her. Mostly at this time of night we stop and listen to the night sounds.